Last Thursday, I saw the movie Transformers with a friend. As we walked out, I started to share what I thought was an interesting observation about Optimus Prime and his acceptable level of casualties. “Is this a blog post?” my friend interrupted. “No,” I assured him and I started citing examples from WWII and all the doctors who died from radiation sickness trying to master X-rays. You know…there are things I forget about history. You should have heard me and Larry bantering on and feeding each other misconceptions when we stopped by Valley Forge a few years ago. You should also have seen our synchronized, stupified hush once we started reading the real details. I felt a similiar pause of ignorance when I read about how drastically the colonists changed this land. It is actually not unlike the red vines in War of the Worlds. The colonists struggled to survive in this new environment so they converted it to what they were used to. The planted their own plants (granted not as scary as the red vines). They brought their own lifestock (horses, cattle, pigs). And some things that seem so natural in the ecosystem now came from Europe. Nightcrawlers! Honeybees! I was surprised and at the same time I felt I should have known better. Another thing about these colonists. Bear Grylls and/or Les Stroud would have much to frown upon. I know what the colonists did was brave and took courage that I would never have (Heck, I dillydally about moving 150 miles away). But, with my running water, my heat and, most importantly, my internet, my spoiled self still questions the will of the colonists. Let’s overlook the fact that they banked too much on trading with the Indians and they didn’t plan on growing their own food (Solid plan there, fellas). 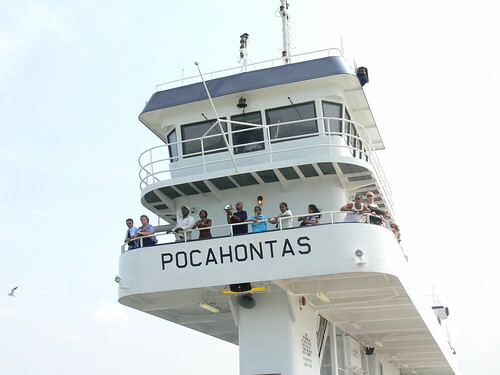 The thing that struck me the most was the account that during “The Starving Time” the colonists were too scared of Powhatan hostility to leave their fort to look for food. 80% of people died that winter and get this– some people dug their own graves, laid down in them and waited to die. What?!? If you are already acquiescing to death and you still have enough energy to dig a grave, is there that much harm of going outside and try to find some food? Bah! Speaking of which, it sounds like John Smith was the Bear Grylls/Les Stroud of the day. In a previous winter (he was back in England during The Starving Time) he, as crazy as it sounds, actually went on a mission to find food for the colonists. Good for him. One final note– Jamestown was privately funded. It wasn’t a government venture– it was investors. They formed the “Virginia Company” and had hoped to strike it rich with gold and silver. I like the example that you don’t need a federal government to fund discovery. Though an example without people eating their dead may be a little more uplifting. 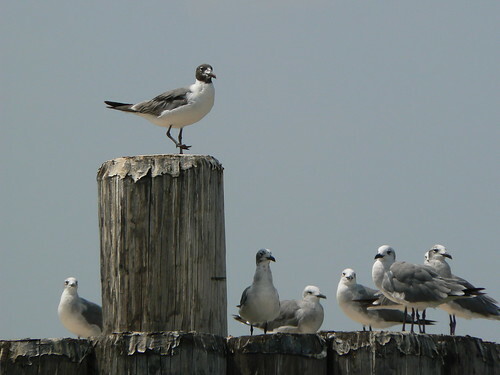 Seagulls– Native or did they come from Europe? 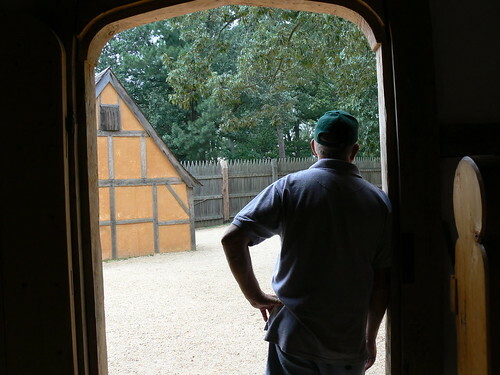 Sean’s Dad at a Jamestown Church – Thinking about digging his own grave? Larry and I got to see 10 miles of this road in April. Besides the usual snow plowing that takes months to complete, this year a rainstorm washed away part of the road and delayed the opening until July 1st. The RealAge Test, but for dogs. It takes into account your dog’s health and lifestyle and reports back his/her age in people years. Jimmie (10) was 39.6 and Henry (8) was 48.9. Well if one worries about spoilers from a movie from 1989, one should not read any further. On Sunday when it came time to paint the ceiling of the upstairs hallway, I found out who my “Steel Magnolia” was. Sean didn’t participate in any of the house projects this past week and this one no different– he watched TV. My mother had given me ample notice that she had no interest in ceiling painting, plus she was weary from four solid days of dedicated work. She stayed downstairs and read a book. It needed to be done, so armed with my roller, my white can of paint, my hiking headlamp (really good to help see missed spots) and an eccletic set of dropclothes, I commenced the chore. It wasn’t long before I realized I wasn’t alone. Who was with me? Jimmie! He curled up on one of the dropclothes and watched. His support did not falter– He stayed upstairs the entire time. And amazingly enough, he never once got in the way. When I needed to stand in his spot, he took a few steps down the stairs and just waited until my work in that area was done. Even though he’s just a dog, I appreciated his moral support. And where was Henry the Beagle? Cowering downstairs. There wasn’t a single aspect of this operation, ranging from rollers to dropclothes, that did not terrify him. I guess I know which dog will not protect me in the face of danger. While I am on the subject, I do have to highlight my mother and her contributions this past week. There were things that were not fun, but she did them cheerfully. Sometimes we were listening to her CD (Avril Lavigne) but even when we were listening to my CDs, she didn’t complain. Her expertise and work ethic were valuable, but more so was her company. That is a trend with my mother– I can really count on her company. Here’s a quick example from college. I loved the Kids in the Hall and I really, really, really wanted to see their movie Brain Candy when it came out. Alas, I couldn’t find a single person to go with me. Finally, my mother agreed to accompany me. There was a scene in the movie my mother found so disgusting she gagged— and she STILL stayed for the rest of the film and she still continues to go to movies with me to this day (though she routinely reminds me about the Kids in the Hall debacle). I think more contemporary evidence surfaces when you look at geocaching. 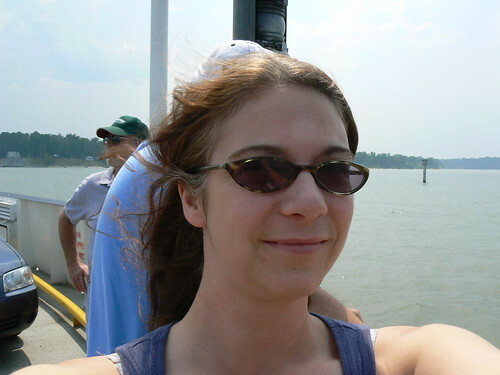 My mother has accompanied me on more geocaches than any other person– even the young, adventurous whipper-snappers like Stacy. Mom’ll tromp through the woods, dodge thorny bushes and when we get close, she’ll point out suspicious piles of sticks or leaves. All this stuff– helping me with home repairs, braving gag-inducing movies and finding pieces of tupperware in the woods– she does this, at least in part, for me. And I very much appreciate it. (Apparently I show that appreciation by making her remove wallpaper, coercing her to gag-inducing movies and dragging her out into the middle of the woods). Tonight is Mom’s last night in Blacksburg. 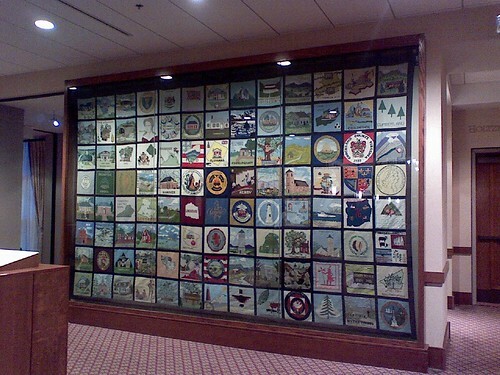 Instead of working on house projects, I took her to Ben and Jerry’s (she accepts ice cream as payment for services rendered), a drive around campus and then I took her to the relatively new Inn at the Virginia Tech. 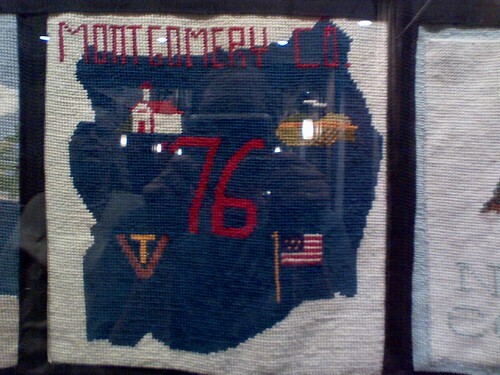 In particular, I took her to the needlepoint that is on display there at the conference center. I pulled up the Montgomery County Seal for guidance. 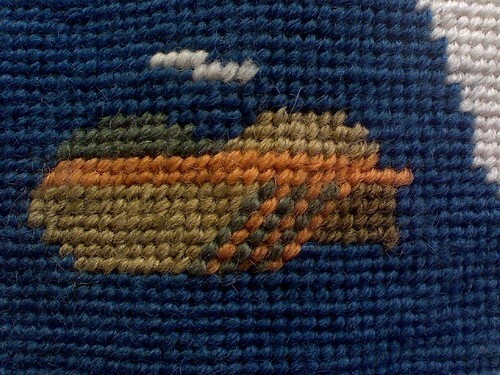 I’m thinking it is supposed to be a rifle? 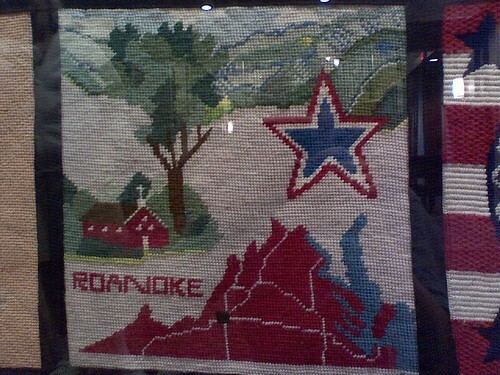 The Roanoke Veterans would be pleased to see that the Roanoke Star is depicted as Red, White and Blue here. From Google Cache– I used the Removing An Old Toilet steps today. The tip about soaking tank bolts in oil came in real handy when removing the tank. Dude– did you know you could *rent* a waterbed pump to expedite the draining process?!? UHaul has it for $7.95 a day. I rented one in Blacksburg at Heavener Rental. Was able to drain and return the equipment in about 2 hours.